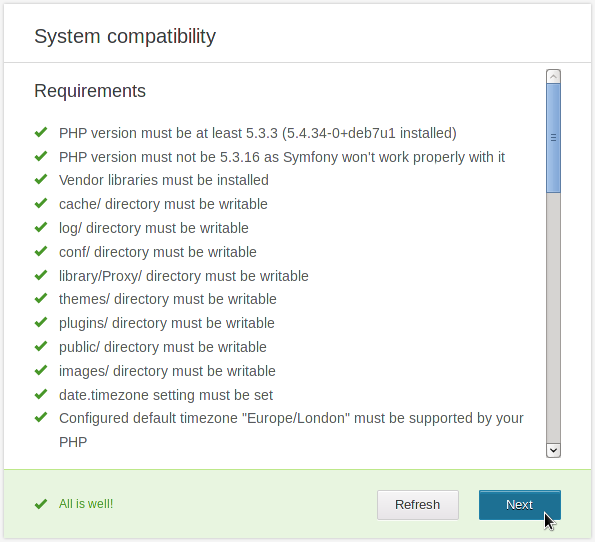 At the URL of your publication's server, Newscoop should display a System compatibility page indicating the status of dependencies. If there are any crosses instead of green check marks, check your server has the packages shown. Otherwise, click the Next button to run through the installation steps. 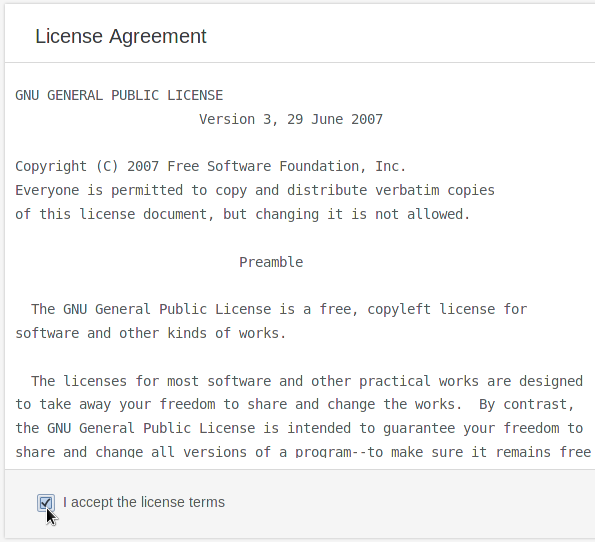 The next step is for you to review the license under which Newscoop is distributed, which is the GNU General Public License version 3. Check the box and click the Next button if you accept the license terms. Next, you need to set the Server name for the database, which will be localhost if Apache and MySQL are running on the same machine. You only need to change the number in the Server port field if you are using a non-standard MySQL port. Then enter the User name, Password and Database name that you set up earlier. If you enter a Database name which already exists on the specified server, you will have the option to Overwrite existing database. Only click this checkbox if you are very sure that any existing production databases are fully backed up. 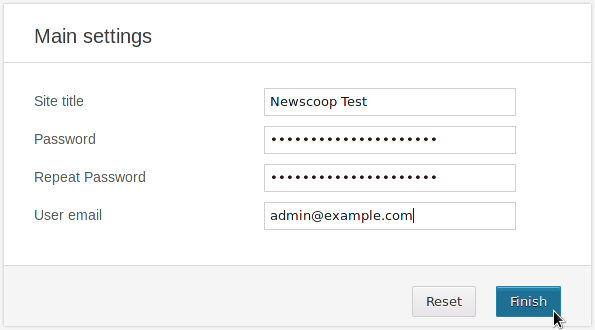 Next is the Main settings page, where you set the name of your first publication as the Site title, as well as the password and email address for Newscoop's Administrator, the admin user. 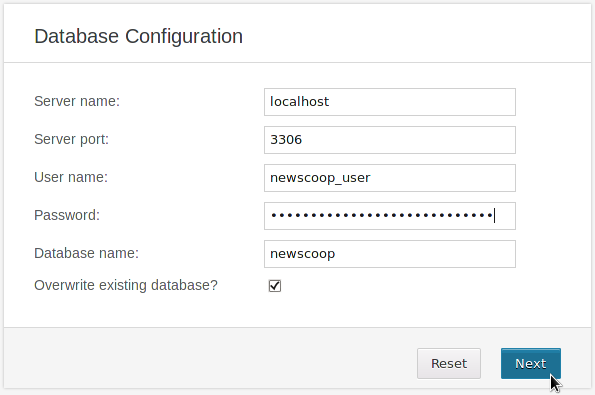 This user account is critical for management of your Newscoop publications, so make sure that you set a strong password and keep it somewhere secure. You will need to log in with the user name admin to begin with, using the password that you set for the administrator during the installation. See the Getting started chapter for details. 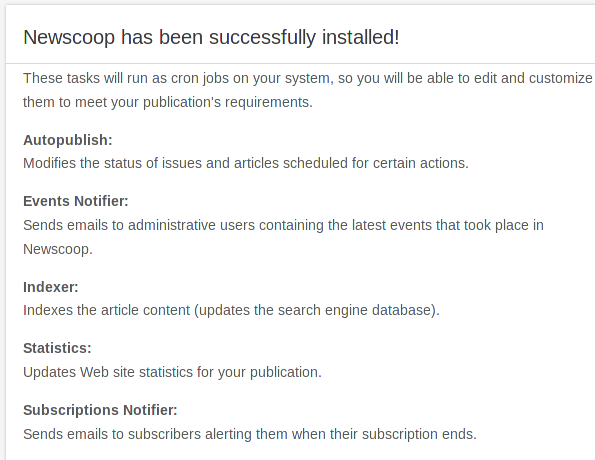 Scroll down to see the automated maintenance tasks which have been set up on your Newscoop server. If you attempt to access the reader side of your new website before logging into the administration interface for the first time, you may see an error message in your web browser. 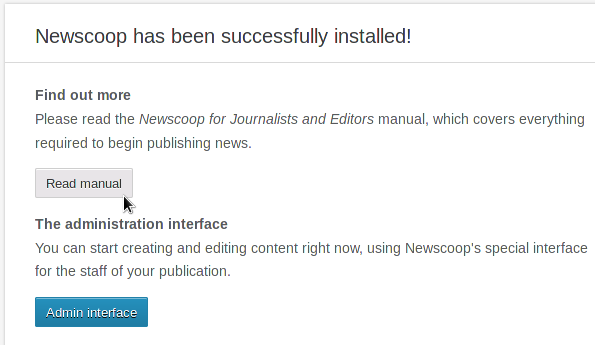 This aspect of Newscoop configuration is dealt with in the Creating a publication and Creating an issue chapters of this manual.